At Kumbakonam, the event is captured in two independent panels- the birth of Rama and presentation to the King. At Pullamangai, the panels directly proceed to royal presentation after the distribution of Pinda. Here, the birth of princes is indirectly implied but not explicitely sculpted. Queen Kausalya is lying on a couch and is breast feeding her baby. Her right hand is resting on a pillow while the left hand is gently held around the baby’s hip – supporting his head. This posture should have been directly inspired by contemporary brestfeeding moms of Chola period and this is how moms should have held their babies then. Rural woman breastfeed their babies in such positions to this day. The long and slender legs of the queen are resting on another pillow and her tired feet are gently massaged by a maid. The slender waist, long legs and broard shoulders of the queen are skillfully sculpted by the Chola sculptor – bringing out the beauty of Kausalya with verve and vigor. Various vessels (possibly made out of brass) are seen below the couch – once again drawing inspiration from contemporary assets. Three maids are seen in the background. The distance between these three maids and the queen has to be assumed. The one in right hand corner of the panel is holding something in her left hand. She is attentively listening to the conversation between the other two maids, which is in progress. Among the conversing maids, the one on the left side (of the spectator) is resting an unidentifiable object (possibly a musical instrument) in her left shoulder; the other is simply talking to her with raised right hand. These four maids should be considered as intimate companions of the chief queen and they are keeping her in good humor after the delivery. The panel is divided into two horizontal segments. The bottom half is occupied by the brestfeeding mother and her baby – who are the central figures of the panel. The upper half is allocated to four maids who are companions of the queen. The overall mood of the sculpture is that of gentle joy and the satisfaction provided by the arrival of newborn. This scene is conspicuous by its absence at Pullamangai and other locations. 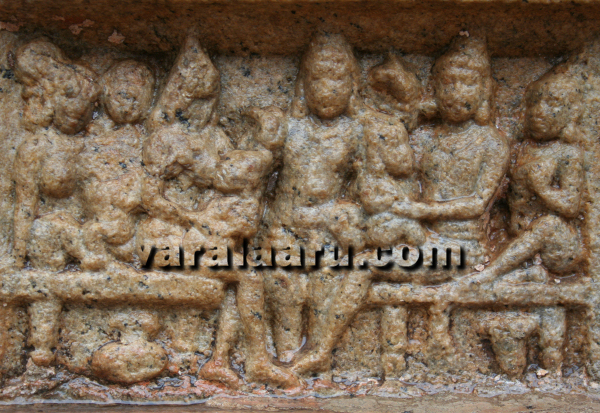 King Dasaratha is seated in a chair with his favourite queen by his side. One of the new born babies (possibly Rama) is seated in his thigh and is anxiously looking at his father. The king’s left arm is supporting the baby. The joy and compassion of Dasaratha is very explicit in the panel and needs no further elaborations. His favourite queen Kaikeyi, who is seated next to him, is enjoying the scene. Her left hand is held in her breasts. The other two queens are seated in another chair, in front of the King. The broad smile on the first queen is clearly visible, in spite of a thousand year passage of time. Both are breastfeeding their babies. A maid is overlooking the scene from the background. Surprisingly, the babies add up to just three. The forth one (possibly Shatrugna) is not sculpted. 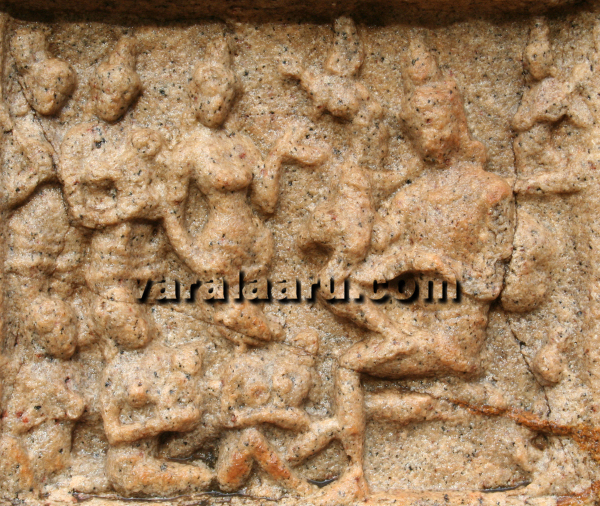 It is noteworthy that Shatrugna is not portrayed in any other panel at Kumbakonam. Two vessels are kept under the chairs. Both of them resemble brass vessels used in ancient Hindu temples to this day. A male figure is seen in the middle of the panel, in the background. He is clearly not a character in the scene depicted in the front; this is borne out by the fact that his legs are going well below the floor level. He is possibly a narrator or Shutradari - standing in the backstage and explaining the significance of the event to the spectators. His left hand is raised with index finger pointing above while the right hand is directed towards the queens. This repeated two layered composition (characters in the front and narrator in the background) met with at Kumbakonam suggests a strong influence of contemporary dramas on the narratives. King Dasaratha is confidently seated in a chair in Virasana, holding one of the babies (Rama?) in his arms. His posture is relaxed and assertive - as compared to the earlier one (Pinda distribution). He is visibly enjoying the presence of royal offspring in his arms. The baby is looking restless, trying to pull the ear ornamemt of the king. Two maids are shown in small sizes behind the king. They seem to be holding musical instruments in their hand and playing auspicious music (Mangala vadya). A third maid, also of smaller size, is kneeling in front of the king and is engaged in some unidentifiable activity. The three queens are seated on the floor - their heads anxiously turned towards the king. The first two are holding babies in their arms while the third one is simply sitting. Strangely, none of them are breastfeeding. Three female figures are seen in the background. The first one standing next to the king is announcing the birth of babies to the king. Her right hand is held in her thigh while the left hand is raised. Her headdress, attire and ornamentation imply that she is not a common maid but a member of the royal household. The assertion with which she is addressing the king is striking; it is likely that she is not just yet another royal member – but possibly one of the second level queens of King Dasaratha. The many curvatures of her physique make her appearance captivating; her dominant posture and the occation in question call for several subtle possibilities. The second female is holding one of the babies in her arms. Her attire once again suggests that she is another queen – but her posture is not as dominant as the first one. The third female standing behind the two seems to be a maid or attendant. She is holding a lengthy object (possibly a music instrument) which is resting on her right shoulder. It is noteworthy that Pullamangai includes all the four sons of Dasaratha unlike Kumbakonam which portrays only three. At Kumbakonam, the compositional similarity between the present panel under discussion and the previous panel (Pinda distribution) is remarkable. In both scenes, the King is shown with one of his queens on one side and the rest are placed on the other side. The narrator is in the middle – in both cases. The repeated representations of King with his favourite queen on one side might have been inspired by contemporary ‘Anukkis’ of Chola Kings – female companions who were not recognized as Queens but who wielded enormous influence and respect from the King and the society at large. At Pullamangai, the composition includes ten characters in all – including four maids and two secondary queens. At Kumbakonam, there is only one maid and one narrator. At Kumbakonam, a narrator announces the birth of royal offsprings whereas at Pullamangai, a second level queen (or some other member of royal household) is announcing the good news to the king. In comparison, Kumbakonam dramatically excels in both occations by portraying moms in their most natural and serene activity viz. breastfeeding.